You might not be suspected of trafficking cocaine and your car might not have a warrantless GPS placed in it by police. But the legal issues raised by the Supreme Court matter for everything you do online (and off). When discussing constitutional law, it’s become a cliché to mention how the founding fathers didn’t have newfangled modern technologies. GPS systems, computers, atomic bombs… none of those existed in the era of Franklin, Washington, and Madison. Like many ideas, this is a cliché because it’s true. In a ruling earlier this week (United States vs. Jones), the Supreme Court decided that attaching GPS trackers to vehicles without warrants violates the Fourth Amendment. The Court decided in a majority opinion that the use of GPS trackers without a warrant impinges on our right to be free of unreasonable searches… but, here’s the kicker: a minority of justices, headed by Samuel Alito, argued that long-term GPS tracking–with or without a warrant–violates privacy expectations. In other words, every justice on the Supreme Court has reservations about using GPS tracking as a law enforcement tool. As the disruptive technology boom of the past twenty years matures, the Supreme Court will be seeing many more cases like this. GPS systems, smartphones, unmanned aerial vehicles, cyberattacks, online commerce, and digital copyright law are all on the cutting edge of law–and how the Supreme Court (and others) interpret them will set the stage for decades to come. Antoine Jones, a Washington D.C. nightclub owner, was at the center of United States vs. Jones. District police believed Jones was linked to a cocaine-trafficking operation. The police, without obtaining a proper warrant, hid a GPS tracker in his wife’s car that was monitored for a month. The GPS device pinged district police every 10 seconds with location info on the car. Evidence gathered from the GPS tracker was used to help convict Jones of conspiring to sell cocaine; he was subsequently sentenced to life in prison, though the decision was later overturned by the U.S. Court of Appeals for D.C. Ever since GPS trackers became easily available on the commercial market, sales have boomed for the law enforcement market. Police departments and federal agencies love GPS trackers; they are relatively inexpensive and provide valuable data on the whereabouts of suspects. Jones, of course, was not the only suspect whose GPS location was monitored for a long period of time without a warrant. United States vs. Jones consolidated and affected a number of similar cases. These range from Arab-Americans in northern California with no criminal history suddenly finding GPS trackers in their cars to bank robbers and other people suspected of serious crimes. Law enforcement use a variety of methods to get GPS trackers into vehicles; these range from old-fashioned scrambles to hide a device under a car to amazing air guns used by the LAPD that literally shoot GPS-enabled darts into the open windows of passing vehicles. According to the Electronic Frontier Foundation (EFF), police in Arlington and Fairfax (Virginia) used GPS trackers 229 times between 2005 and 2007. We are in the middle of a period of massive technological disruption right now. The concurrent rise of the internet, smartphones and miniaturized technology is causing changes–and not just in the United States!–as dramatic as those set into motion by the printing press, the automobile, and the airplane. For the next few decades, judges and legislators will be trying their best to apply a massive body of jurisprudence to newfangled technologies. For example, the DEA and police departments nationwide apply algorithms to satellite imagery in order to find meth labs. In a Colorado District Court case, the United States ruled that suspects may be forced to give up encryption passwords to law enforcement. Just last week, Anonymous launched a massive DDOS attack on the Justice Department after the MegaUpload bust. Back in November, unknown hackers managed to sabotage railway lines in the Pacific Northwest by disrupting automated safety signals. The FBI routinely buys massively detailed consumer information [PDF] in bulk from commercial aggregators to get around restrictions that prohibit them from spying on American citizens. Meanwhile, law abiding citizens find that hackers–often armed with ludicrously simple tools–manage to steal their credit card numbers from poorly defended commercial sites on a seemingly weekly basis. 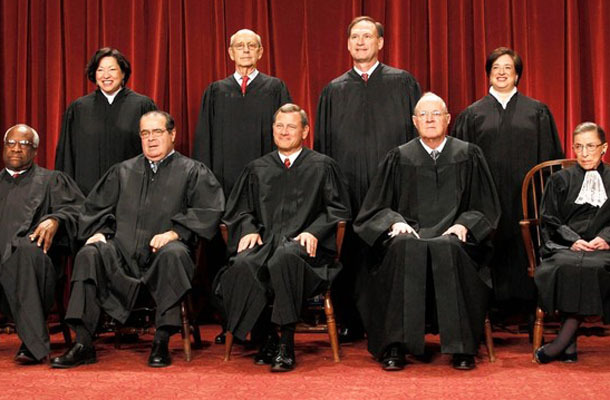 All of these issues will cause significant challenges and headaches for American jurisprudence. In his concurring opinion, Alito implied that it was up to Congress–not the Supreme Court–to enact legislation to properly regulate newly emergent technologies. The current Congressional law covering most computer activities was enacted in 1986, back when the author of this article was in kindergarten. Meanwhile, the furor surrounding SOPA and PIPA revealed that most of Congress is shockingly poorly informed about technology (and, incidentally, made Facebook and Google realize that they must lobby like MPAA/NRA hell for their own commercial benefits). The judicial and legislative decisions of the next 20 years are going to determine how you use the internet, conduct business, how you use your phone… even how you watch television. Here’s hoping our lawyers, lobbyists, and elected officials are up to the challenge.